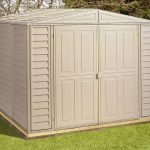 This compact PVC shed has a lot to recommend it, so it’s ideal for people who have a small garden and yet still want the benefits that a storage space can bring. We were pleasantly surprised at just how much fits inside, and that’s because it has wide opening double doors that allow the owner to make the most of every inch of available space. Another advantage that its compact design has it that it isn’t obtrusive. Even though it’s made of plastic it will blend in with a garden environment particularly if the property already has other PVC elements such as fascias or soffits. Despite its relatively small base area the apex roof gives it a reasonable height, and it’s also very effective at carrying rainwater away. This is also achieved by the overlap style cladding, so the contents will be kept dry whatever the weather. Further reassurance is provided by the manufacturer’s warranty which lasts for a very generous period of 15 years. With no maintenance or future treatments needed as well, it’s a good choice for people who have busy lives or who simply want a storage facility that they can install and then forget about as they use it on a daily basis. This small yet versatile plastic storage hut can be a great low cost addition to any garden. 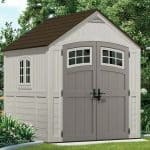 We can imagine it being used either as a compact storage shed for small gardens, or even as an additional low cost storage facility for people who want to use a larger shed for leisure purposes. We found the ivory cladding quite attractive, and it should fit in well with modern property that already has PVC around their windows, roof lines or conservatories. The apex roof has quite a shallow pitch, and yet it still eases rainwater or even snow away. It also creates a ridge height of 1.99m and an eaves height of 1.80m. These are amongst the tallest we’ve seen for a compact plastic shed, and mean that it’s easy to store taller garden items inside. The overall depth is 0.81m and the overall width is 1.60m, so it won’t take up too much room in a garden. 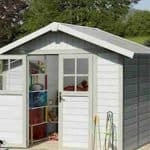 We always welcome the use of plastic cladding on small storage sheds as it offers lots of practical advantages when compared to traditional timber or even metal. There is of course the fact that PVC won’t rot, rust, or warp but it’s also fire retardant, which means that the shed can be used as a secure area to store flammable items. It has to be said that this wasn’t the thickest cladding that we’ve seen on the PVC sheds we’ve reviewed, although the moulded plastic floor was significantly thicker, but once assembled it still feels strong and reliable. Another advantage supplied by plastic sheds is that they don’t require any treatments or maintenance, giving a considerable saving of time and money when compared to many timber sheds. We were pleased to find that this shed comes with a 15 year manufacturer’s warranty, as even though the nature of the substrate means that it should have no difficulty exceeding this period it still gives added peace of mind to the customer. 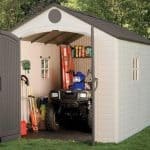 In our opinion, the double doors of this shed are its stand out feature. Not only because being made of moulded plastic they feel strong and secure, but because they take up the full frontage of the shed and therefore have a very accommodating opening. The door width is 1.34m and the door height is 1.78m, which are both significantly more generous dimensions than we often see. The result is that it’s very easy to store items of almost any size and width inside, and you don’t have to stoop or twist when using the door. There are no windows, but the size of the doors means that the interior is bathed in light when they are opened. We feel that the lack of windows is an important security feature, as it means that there is no way for people to see what’s kept inside. This makes it much less likely that the shed will be picked out by potential thieves who are invariably looking for easy pickings and a guaranteed return. To boost security we would have liked to see a padlock included, but while this is sadly missing the handles are ready to accept one so this can easily and inexpensively be rectified. If anything if value is going to be stored, we’d recommend the addition of such a padlock as an essential purchase. 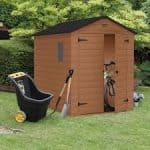 We were pleased to see that a range of optional extras can be bought with this shed, including a wheelbarrow, a portable tool rack from Tool-Plus, and an outdoor water station that can be used as a greener way to water the garden. The option we think will be most useful, however, is a stand alone shelving unit. Measuring 0.76 X 0.51m, it allows the owner to make the most of the vertical storage space provided by this shed. 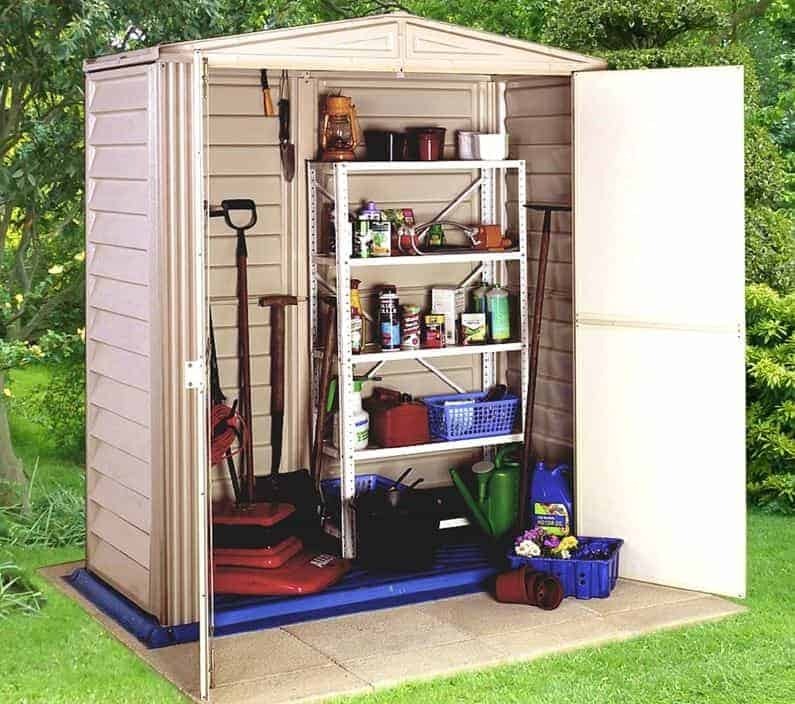 It also means that the shed can be kept tidy and well organised, which in itself can be another way to increase the amount of goods that can be stored inside. We were glad to see that the relatively low price point didn’t mean that there was any discernible loss of quality when it came to the components used. Plastic cladding is a very durable substrate, as the long warranty included here shows, but we feel that thicker cladding would have made it even more durable. Even though this is a very compact storage facility, the wide opening doors mean that the owner can make full use of the space that’s available. We found the assembly of this shed to be a little trickier than we had expected, so do read the instructions carefully before starting. Allow three hours for the task, as long as you have a friend to help. 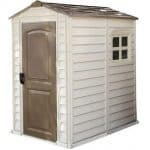 Even though we’ve reviewed similar sized sheds at less than three hundred pounds, we still feel this represents reasonable value for money. Final Thoughts: Garden storage huts have evolved, gone are the days when they had to be painstakingly treated every year with wood preserver. This PVC shed is a modern storage solution that means people can install it and then sit back and enjoy the benefits without having to lift another finger. For people whose time is at a premium this can be a real blessing. There are many things that we liked about this shed, and that includes its stylish and contemporary appearance. Its window free design also means that this can be a very secure environment with the addition of a padlock.